Ruth Freeman (b. 1969, Enid, Oklahoma) received both a Bachelors of Architecture degree and Bachelors of Interior Design from the University of Oklahoma. She received her MFA in Fine Arts from the School of Visual Arts in New York City (2016). She has been involved in curatorial and exhibition design in both the US and Japan and her paintings have been featured in several exhibitions in New York, including select group shows at Thierry Goldberg Gallery, E.Tay Gallery, and Mountain Gallery in Brooklyn. 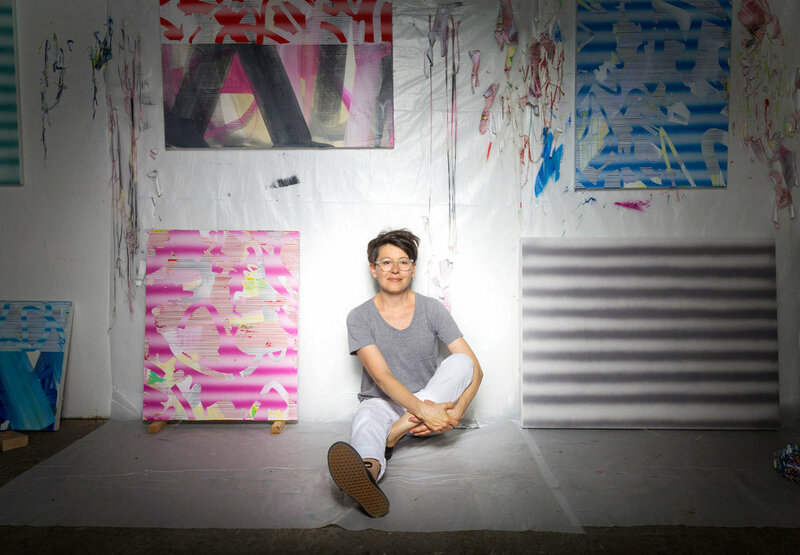 Freeman had her first solo show last year at Beers London and her paintings were exhibited at PULSE Art Fair, New York in 2016. Her work is published in New American Paintings Northeast Issue #122 and MFA Issue #129. 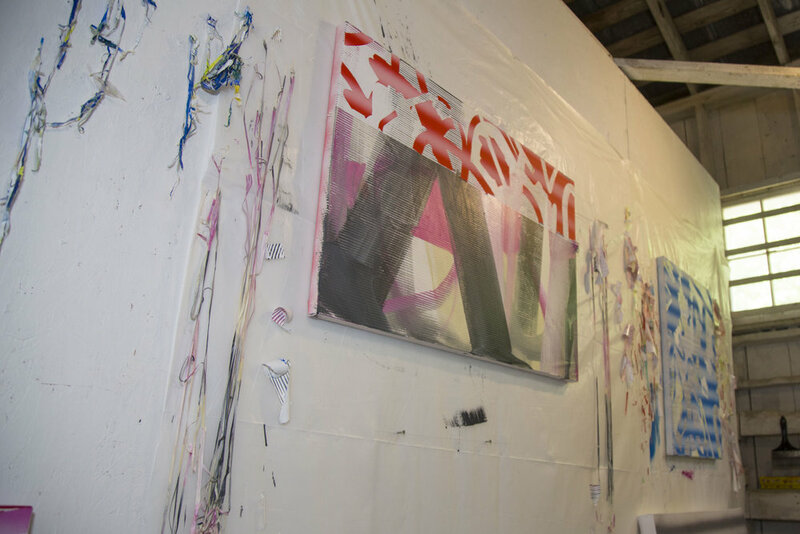 Freeman partook in a month-long residency at the Vermont Studio Center in Johnson, VT in June 2015, and currently shows her work through COUNTY Gallery in Palm Beach, Florida. Ruth lives and works in Brooklyn, NY. You’ve mentioned that you have a background in architecture and that your paintings are influenced by a time when architectural practices switched from hand drawings to digital renderings in the late 90s. It was a really interesting time because the technologies like 3D rendering, 3D vis, all these softwares, were kind of just promotional tools for architecture at that point. The renderings we were starting to do were extremely awkward and would look weird. The hand drawings looked better, but we would do the digital renderings as more a promotion — to demonstrate that we were into 3D rendering and up to date with our use of the available technologies in the industry. Anyway, the 3D renderings started to look really strange. And at one point, after enough of the projects had been materialized, we started to realize that when these 3D renderings were built there was an unexplainable disconnect — like even though they followed the plans, they weren't quite what had been designed. Something was missing, and we couldn't figure out what it was exactly. It was more of a feeling. So for me, it felt like an awkward time in the industry. We were all expected to keep up on the newest 3D rendering software even though the results that were being generated didn't feel quite right. When I started painting and reflecting on my process and what influenced me, I realized that I was using digital tools in my paintings in a way that was picking up on some of the awkward moments I had encountered in the architectural field of the 90s. I'm still trying to work through the awkwardness of digital tools 30 years later, even though now that awkward, adolescent, in-transition phase once associated with rendering software has come and gone. The paintings you're currently producing incorporate both digital rendering software and hand application techniques. The line thicknesses and hardnesses, the use of multiple overlapping and transparent layers, the various effects and types of marks employed, as well as the flatness of the end result all work together to produce a certain kind of awkwardness — a well composed dissonance. With the formalities of abstractions, one is always working with foreground and background. Now that we look at a lot of artwork digitally, my work has taken on a different kind of meaning. It interfaces differently. When it's a painting produced by hand, these digital qualities and processes are looked at and understood differently than if it was a print-out of a digital rendering. In terms of the process, I'll start out with a background on canvas. Then I'll bring it into the computer and do some renderings. Then I'll bring it back out onto the canvas. And this process continues until the last layer where it often becomes very gestural. While I'm here at Wassaic, I'm hoping to try out some different paint-gesso mixtures and experiment more with this last gestural layer. I'm also hoping to spend some more time working through colors. I tend to be drawn to bright colors, in part because of working in digital space, but I'm interesting in exploring muted colors and softer tones while I'm here. Anyway, there's a lot of masking and layering involved, and because of this back and forth there's a weirdness that sets in and produces an awkward relationship between the foreground and background. I consider the ways that I can make this dissonance — between foreground and background, digital rendering and hand drawing — really work for each of the paintings. It's about breaking things down through a systematic process. At least that's what I hope to achieve. Both in terms of what the painting looks like on the wall and on a screen. Why is important to you that the result of this extended process of back and forth movement — between digital space and the space of the canvas — ultimately ends, categorically, with a painting? I think to address that question it might be helpful to return to a discussion of architecture that I'm familiar with because of practicing for a while — in the end it's a building. Thinking about processes as becoming an object is how I've always worked. In this current scenario, the building is a painting, and the processes I employ allow me to bring the painting into being as an object. How long have you been making work in this way? It's a relatively new body of work. I've been developing it since graduate school so it's about 3 years old now. A lot of times I work with Procreate. It's a really 2D program so depending on the color choices different elements will move into the foreground or background. This is really where most of the architectural rendering comes in. They're drawn on an iPad so the conditions of their production also comes into play. It's like a rendered finger painting process. Which also calls to mind the digital signatures that we all make now when we're checking out at the supermarket or wherever. You know you're supposed to sign but everybody just does a little drawing. I also think the paintings are straight-edged and loose. The forms have gotten more and more intricate and seemingly casual with time. I recently introduced a horizontal taped line which came out of a conversation with my advisor about what I could add to the paintings to emphasize the relationship between digital and physical space — like it's either a pixel or it's a line. I started working with an airbrush early on because I was thinking about the idea of touchless tools and digital space. Jeff Elrod has had a big influence on my work. Then I started getting into more gestural textures and impasto which you can't read when you're looking at a piece on a computer screen. Looking at your paintings in this space — a barn — and considering their attention to lines, layers, and diagrams has made me reconsider the architectural elements around me. 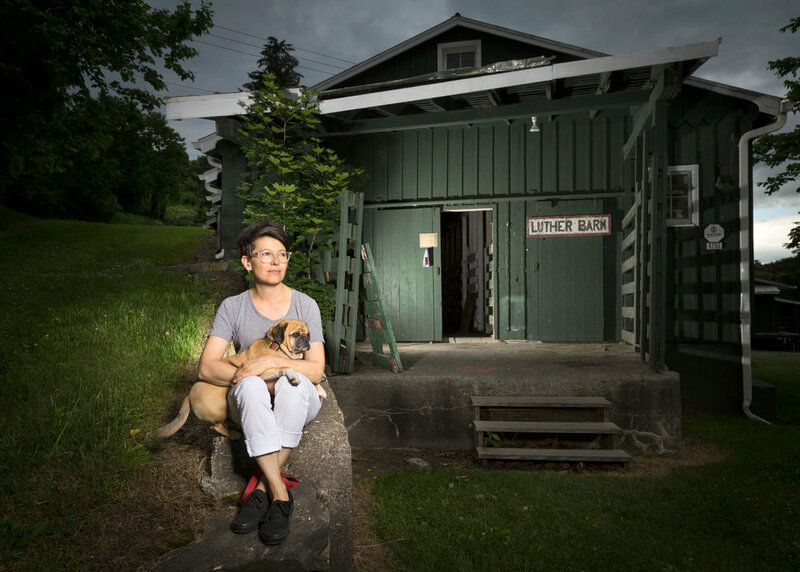 Have you taken the built environment of Wassaic into consideration yet? I've been talking with a lot of the other residents about how this place will affect our work. But I don't really know how being here at Wassaic — within the context of this barn and all its horizontal lines — will impact my paintings. Perhaps it will direct my process towards more sculptural work. Who knows, maybe the paintings will come off the walls and lean at angles in relationship to the built environment. I suppose the question is how the digital realm will relate (passively or actively) to these repurposed buildings through whatever work I end up producing while I'm here. One thing's for sure: Wassaic is definitely not a white cube. Your paintings feel very joyous. Which I suppose is a feeling that might get translated into paintings more than into buildings. Don't take this the wrong way, but a lot of my friends that are practicing architects are masochists in the worst sense of the word. I found myself thinking about your paintings as a sort of counter to that type of existence. Which in turn made me wonder what their playful energy is about and where it comes from? That's really interesting that you brought that up. The main reason I got out of architecture, although I still do a little design work on the side, is because it wasn't fun for me anymore. It's very labor-intensive, the hours are long and joyless, and maybe that's showing up now and it's a sign that I needed a break. But yeah, the joy shows through in the colors and the forms. Things don't work in architecture and it's frustrating. Especially when you're doing a lot of the detail work. Things get so small and closed-in. There are time restraints. There are budget restraints. It can really take over your life if you let it. A lot of times you're expected to let it. I don't know, I mean, I got into architecture for the creative side of it and a lot of people do. And the reality is that while a lot of people get into the field for these reasons, very few of them are actually able to do it. It sounds like you also got out of architecture for the creative side as well. Do you see yourself making any significant changes to your painting practice or its current direction in the near future or are you planning on continuing this body of work for awhile longer? Yeah. There is a certain desire to get more sculptural. What that'll do to the digital drawing part of the process I'm not sure. It's a really interesting time for me right now because I was away from my practice for two or three months because of a family issue. So now I'm coming back into it with fresh eyes. 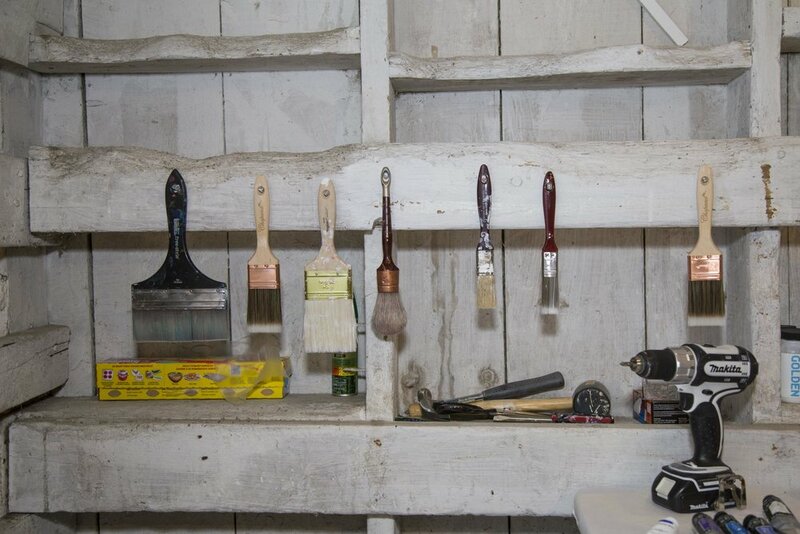 This is a perfect opportunity to be here at Wassaic and to be in a new environment and see my work differently. Lately I've been feeling like it's time to make a move but I'm not sure what that'll be yet. Whatever it ends up being I know I won't totally abandon what I'm doing. There was one thing in graduate school that I was told that has stayed with me. A professor said that I didn't stick with things long enough. I would jump around, and even though it was all painting I didn't give my practice enough time to evolve. So I think I'm going to try to make changes at a slow pace. Maybe change one element instead of all of them and spend the time that I should with what I'm already doing. I think that with the expansion of the digital realm coupled to a desire for instant gratification, we tend not to be as patient with our work, ourselves, and the people around us. Well, for me at least. I'll just speak for myself. It's not as easy as it used to be. I'm finding that in this kind of context I have to remember to ground myself and slow down in order to evolve with intention.